While it’s no secret I’m a huge fan of ethnic cooking for both flavor and frugality, the truth is there are other reasons why shopping at international markets for at least part of your grocery haul is a good idea. In many of these markets, bulk deals are just as prevalent as they are at your nearest Sam’s Club or Costco. The prices are often cheaper as well. I routinely purchase tahini by the gallon and fava beans from the bin at my nearest Middle Eastern market, while the nearby Indian and Pakistani grocery store offers huge deals on brown basmati and garbanzo flour. One of the top bargains at any of these stores however is spices. Giant bags of fennel seeds, turmeric, cinnamon and more are provided at prices that make it possible to start stocking a pantry for a song. That’s why when it comes to basic seasonings, I always search out international grocery stores when purchasing supplies or setting up a new home after a move. Meat and dairy products are on the rise, making a vegan grocery list seem more appealing, even for those who may have not previously considered it. Hearty eaters need not fear, for garbanzo beans, lentils, pumpkin seeds and even peanut butter provide sought-after protein, while potato and rice fans will simply be able to transfer those purchases to a plant-strong grocery list minus the meat. Certainly, if you still want to purchase the occasional steak you can probably pull that off without breaking the bank. I’m simply pointing out that reducing your animal protein does more than decrease your health risks. It applies significant savings to your bottom line. Private label store brands have come a long way in the past few decades. While pastas, crackers, rice and other pantry staples have always been a good deal to purchase generically, the truth is options have increased exponentially. Several of the supermarkets on my regular shopping circuit offer generic products that make it possible for me to purchase organic food on a budget, enjoy specialty marinades and even serve decadent party appetizers fresh out of my oven with minimal effort. While most of us are aware of the winter holiday price drops on popular items such as turkey, cranberry sauce, stuffing mix and pumpkin puree, it’s easy to forget or overlook the fact that there are similar savings available throughout the year. Albeit for different grocery items. March for example brings stellar savings on cabbage, brisket and even beer. During the Easter season, sales abound on things like sweet potatoes, ham, eggs and baking supplies. Summer brings a boatload of savings opportunities as well, making it easy to throw a tailgate party on a budget or host an inexpensive back yard barbecue. July in particular features penny-pinching prices on everything from grilling meats to romantic picnic supplies and hot dog condiments like mustard and ketchup. When it comes to frugal food strategies, I’m a huge advocate of scouring the weekly supermarket circulars for exceptional deals. Known as loss leaders, these phenomenal prices are offered on things like pork loin, chicken breast, baking butter and other higher-priced grocery items in order to entice buyers into the stores. While stocking up provides greater long-term savings, that’s only possible if you have available freezer room to take advantage of the temporary price point. I’m not saying go out and buy the most expensive giant freezer you can get your hands on. I am saying that if you can afford even a smaller freezer or find a good deal on a second-hand upright, you may want to consider adding a freezer to your personal food storage arsenal. While baking in general is a cost-saving measure compared to purchasing prepared cakes, dinner rolls and breakfast muffins, there are a few strategies at your disposal that will enable you to take things to the next savings level, so to speak. One way is to begin preparing your own DIY dry mixes instead of purchasing things like biscuit mix, cake mix, brownie mix and others. Here’s a recipe for bulk corn bread mix that we enjoy at our house. It jazzes up nicely with whole kernel corn, red pepper flakes and chopped fresh jalapeno if I’m so inclined, but also tastes fine on its own as a dinner side to serve with soup or vegetarian chili. Another strategy is to incorporate the vegan baking trick of learning to prepare foods without fresh eggs. This can add significantly to the price point of homemade baked goods, particularly if you are trying to bake organically. Even if you haven’t given up milk and egg products, knowing how to use soy flour, flax seeds and other egg replacers is a good skill to have. You’ll save significantly, and be able to function if you run out of them or need to stretch your finances a bit further between paychecks. While things like collard greens and lentils are nutritious cheap weight loss foods in their own right, purchasing them at discount grocers provides even greater savings. A few of my favorites around the world include Save a Lot, Aldi, and Penny Market. These stores provide greater value for your grocery buck, albeit with a somewhat reduced selection compared to standard supermarkets. If you need to pinch pennies, these should be a part of your shopping circuit on a regular basis. Let’s face it. Planting a full-blown garden just isn’t something most people have time for. That being said, if you can focus on plant-and-leave perennials like apple trees, rhubarb, asparagus and others, along with a few pots of herbs you can greatly supplement your grocery budget throughout the year, particularly during the summer months. This type of back yard produce plan leaves you free to have a life, only needing to replace plants every few years or so if at all. Grocery savings is certainly a topic that’s been covered before, and I dare say it’s likely to be written about again. That being said, there’s always room for a fresh twist on traditional ideas and perhaps a reminder or two on how you can improve your grub game. These strategies represent some of my favorites. 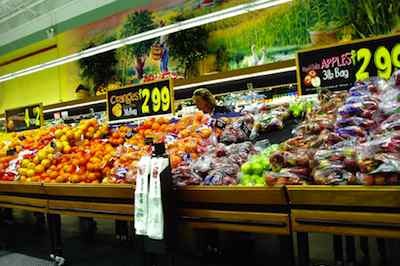 What are your favorite frugal ways to save money at the supermarket? Great post! Thanks for the good ideas on how to strecth a grocery budget. My wife and I have a deep freeze in the garage and use that extensively for buying things when they’re on deep discount. We like to buy milk when it’s on sale (as we have 3 kids under the age of 5) and freeze it. That saves us quite a bit and we just have to pull it out the night before and put it in a sink of cold water to thaw. Love the ideas of buying generics, buying in bulk and slacker gardening. Getting an apple tree, pear tree or a berry bush can be a really good investment. You can keep an eye out for items that are half off since they’re close to the expiration date also to save.